A Barefoot Luxury Experience in Harmony with Nature. 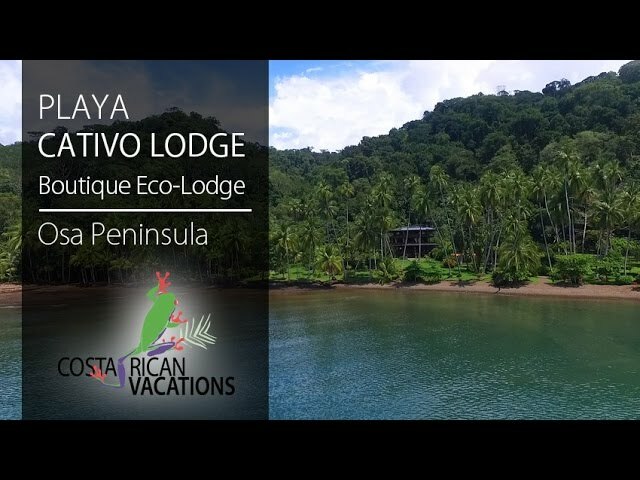 In a private cove in Golfo Dulce you’ll find the beachfront tropical paradise of Playa Cativo. It’s an approximately 30-minute scenic boat ride from Golfito or Puerto Jimenez to the secluded hotel. Located in the wildlife-rich Osa Peninsula, nature lovers and those looking to escape tourist hot spots will love this practically private destination. This is a truly barefoot luxury experience in total harmony with nature. This eco-lodge is set on a 1000-acre private reserve fronting a mile of pristine beach with no other hotel or home in sight. The only neighboring property is the 35,000-acre Piedras Blancas National Park. Thanks to so much protected tropical rainforest, the chance of spotting wildlife is high, especially along the property’s many hiking trails, some of which connect to those within the park. With only 7 spacious guest rooms you will feel like you have the place all to yourself. All rooms feature ocean views and large windows that open to the breeze (but with screens to keep the jungle creatures out). There is so much to do in this peaceful and scenic location: relax poolside, curl up with a book in the library, take a yoga class surrounded by the sounds of the jungle, or check out the on-site organic farm. Complimentary activities include use of kayaks, stand-up paddleboards (SUP), and snorkeling gear, self-guided hiking trails, and a choice of one selected on-site guided tour. Many other on-site tours are available at additional cost. El Gavilan Restaurant features a gourmet, organic farm-to-table dining ambiance. Three delicious a la carte and beautifully presented meals a day are included during your stay. The 30-minute scenic boat ride to get to Playa Cativo sets the tone for your stay. See secret coves and maybe even some wildlife as you cruise by! Thoughtful details like personalized refillable water bottles await your arrival. Staff is always available to go the extra mile for you. The many on-site tours are more than a checklist of things to do—they are an experience you will never forget. A nature walk with an expert guide along the property’s trails will awaken your sense of wonder as you see and learn things you could never have imagined. Nature is literally right outside your window—and the hotel provides binoculars so you can see it without having to leave your room. Listen for the call of the howler monkeys and the sounds of the many birds in the area, then see if you can spot them!